Iran is on track to out-produce Qatar, the world’s biggest LNG exporter, at the vast natural gas deposit they share in the Persian Gulf. But as much as they might want, the Iranians won’t have much gas to export because they are likely to use most of the new production themselves. 1. How much natural gas does Iran export? Almost nothing. Iran has 18.2 percent of proven gas reserves, ahead of Russia and Qatar, according to the BP Statistical Review of World Energy. Unlike its competitors, which have built far-flung pipelines and liquefied natural gas plants to reach foreign buyers, Iran exported 8.4 billion cubic meters (300 billion cubic feet) in 2015 while importing 7.5 billion cubic meters the same year. Until recently, it was a net importer, buying or bartering for gas from Turkmenistan and Azerbaijan because its domestic distribution network doesn’t supply the entire country. Iran exports less gas by pipeline than Myanmar or Kazakhstan, which together hold less than 1 percent of global reserves. 2. So where is all Iran’s gas going? Half of it goes to warming homes, 21 percent to generating power and 18 percent for industrial use, including petrochemicals production, accordingto Cedigaz, an industry research group. Iran, with about 80 million people, is the fourth-biggest market for natural gas, after the U.S., Russia and China. New production can barely keep up with demand. Gas consumption almost doubled to 191.2 billion cubic meters in 2015 from 102.7 billion in 2005, according to BP statistics, while output rose over the same period to 192.5 billion cubic meters from 102.3 billion. 3. Will it export more in the future? Iran plans this year to start sending gas by pipeline to Baghdad in neighboring Iraq, a step that would make it the 15th-biggest exporter, up seven spots from its current rank. But Iraq is planning its own pipeline to export gas to Kuwait and may not prove to be a long-term customer. Iran’s development of LNG plants stalled for years due to international sanctions, and such facilities aren’t a priority given the impending glut of liquefied gas. The country is considering pipelines to Oman, Pakistan and other countries, though cross-border links are scarce in the turbulent region. Floating LNG plants, a temporary fix until permanent facilities for liquefying gas can be built, are also an option. Ali Amirani, marketing director at the National Iranian Gas Export Co., concedes that the nation will consume most of its gas until at least 2024. 4. What about the new volumes from South Pars? By March 2018, Iran’s output at the giant South Pars gas field in the Gulf will have surpassed Qatar’s production at the connected North Field, Oil Minister Bijan Namdar Zanganeh said on March 7. Additional development phases at South Pars should give Iran more room for exports in the future. For now, Iran’s motivation for producing more gas is to re-inject it underground into crude reservoirs, “especially into some of the shared oil fields with Iraq. The other incentive is to supply the domestic market,” Stephen Fullerton, a research associate at consultant Wood Mackenzie Ltd., said in a January interview. Gas re-injection, which isn’t considered part of marketed consumption, can increase the production and recoverable reserves of oil. The entire output from one South Pars phase went into Iranian oil fields, Fullerton said. “They have huge demand for that, especially with the ramp-up of new projects” for oil, he said. 5. So Iran has to choose between oil and gas exports? Exactly. Iran is seeking to attract $100 billion of foreign investment into its energy industry. 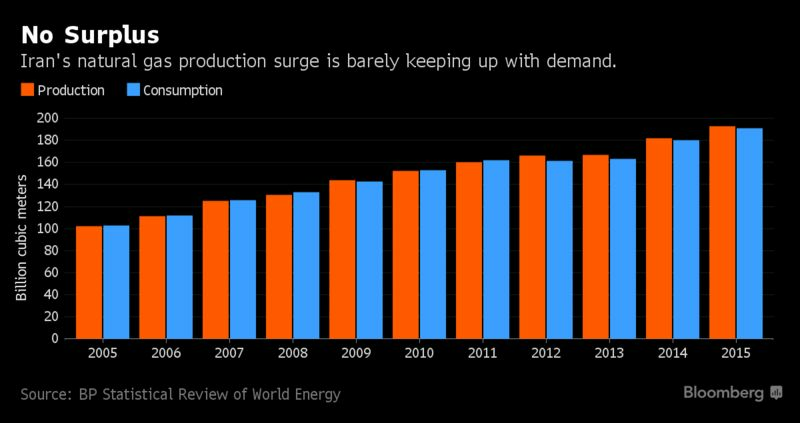 To boost crude output, it needs gas — much more gas than it’s currently injecting. Iran required 93 billion cubic meters of gas for re-injection in 2014 but could only allocate 32 billion, according to Cedigaz. Gas used for oil production, together with domestic consumption of the fuel, is sapping volumes available for export. 6. Is Qatar worried about rising output from the shared field? Qatar has placed a moratorium on new drilling in the North Field since 2005, and its international expansion signals a plan to preserve domestic reserves for as long as possible. The North Field-South Pars reservoir has enough gas for both countries to exploit, according to Wood Mackenzie’s Fullerton. Even though science shows few risks to the field from shared production, a perception that Qatar has already extracted at least twice as much gas as Iran may cause tensions, Jean-Francois Seznec, a scholar at the Middle East Institute in Washington, wrote in an August study.